This gorgeous garnet ring has eight polished garnet cabochons clustered around polished purple spiny oyster shell, set in sterling silver. The silver band is stamped with deer tracks on the outside and the makers mark on the inside. This ring fits UK ring size N / US ring size 7. 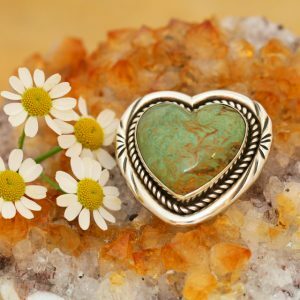 The ring measures 32mm in length and is designed and handmade by Annalisa Martinez of the Taos Pueblo tribe in northern New Mexico, USA. 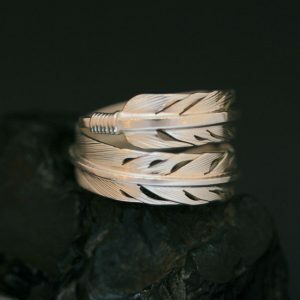 Annalisa Martinez and her husband Joshua Concha, also of Taos Pueblo, have been making beautiful jewellery for Rainmaker Gallery for over ten years. 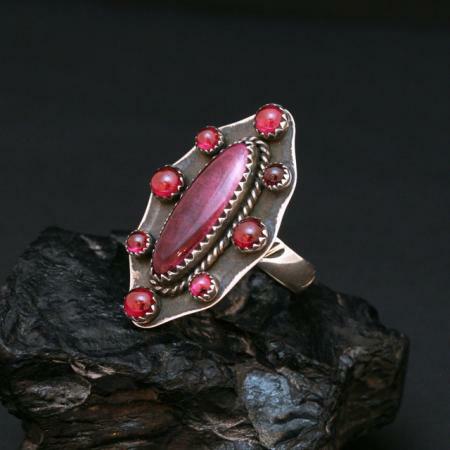 This garnet ring measures 32mm in length and is designed and handmade by Annalisa Martinez of the Taos Pueblo tribe in northern New Mexico, USA. 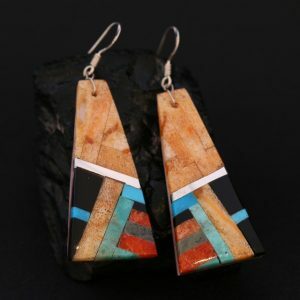 Annalisa Martinez and her husband Joshua Concha, also of Taos Pueblo, have been making beautiful jewellery for Rainmaker Gallery for over ten years.